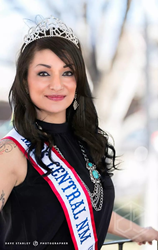 Los Lunas, N.M., resident Lyndsi Alderete never thought of participating in a pageant. Not until last year, when she attended a pageant and had an idea. Lyndsi’s daughter Eliana has pulmonary hypertension (PH) – a debilitating disease of the lungs that affects the functioning of the heart and can lead to right-heart failure. The disease turned the Alderete’s world upside down since Eliana was born in 2003. Lyndsi entered the pageant to raise awareness about her daughter’s disease. With symptoms that include breathlessness, fatigue, dizziness and chest pain, many patients see three doctors before they get an accurate diagnosis. While Eliana has had PH since birth, the survival rate for those who go untreated is less than three years. Lyndsi has never participated in a pageant. This one caught her eye because instead of a talent, delegates are required to choose a platform or a cause to represent. She chose PH and will share her PH story with the judges during her interview and with hundreds of people the night of the pageant. Eliana will even get to be on stage with her mom and get her own crown and sash. Lyndsi will donate any cash winnings from the pageant to the Pulmonary Hypertension Association(PHA). PHA is the nation’s leading pulmonary hypertension organization. Its mission is to prevent and cure pulmonary hypertension and provide hope for the community through support, education, research and advocacy and awareness. PHA relies on donations to fund PH patient and family support; early diagnosis education; specialty care resources; and research to find ways to prevent and cure PH. Headquartered in Silver Spring, Md., with a growing list of chapters across the country, the Pulmonary Hypertension Association (PHA) is the country’s leading pulmonary hypertension organization. Its mission is to find ways to prevent and cure pulmonary hypertension and provide hope for the community through support, education, research, advocacy and awareness. PHA does this by connecting and working together with the entire PH community of patients, families and medical professionals. Among its programs, PHA facilitates more than 245 support groups around the country and delivers continuing education for medical professionals.